Travel trailer hitches are classified by the trailer towing industry according to the amount of weight they can carry. This rating system addresses tongue weight and total weight. Keep in mind that within each classification are numerous travel trailer hitches made by a variety of manufacturers. 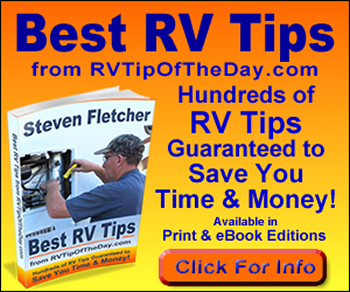 The three most common types of RV travel trailer hitches are the weight-carrying hitch, the weight-distributing (or load equalizer) hitch, and the fifth-wheel hitch or gooseneck. Weight-carrying trailer hitches are designed to carry all of the travel trailers tongue weight. 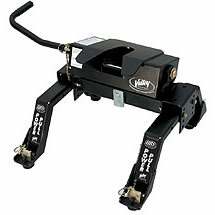 Weight-distributing trailer hitches are used with a receiver hitch and special parts that distribute the tongue weight among all tow vehicle and trailer axles. Make sure the hitch has provisions for the connection of safety chains, which are required by most states. When connected, safety chains should have some slack to permit sharp turns but should not drag on the road. In addition, they should cross under the trailer tongue to help prevent the tongue from dropping to the road in the event the trailer separates from the tow vehicle. 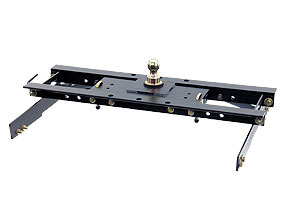 Fifth-wheel hitches are designed for mounting the trailer connection point in the middle of the truck bed. When purchasing a fifth wheel hitch, use the recommendations of the manufacturer of the tow vehicle and fifth wheel trailer based on the type and weight of the trailer. WC GTW – Up to 2,000 lbs. WC GTW – Up to 3,500 lbs. WC GTW – Up to 5,000 lbs. WC GTW – Up to 7,500 lbs. WD GTW – Up to 12,000 lbs. WC GTW – Up to 12,000 lbs. WD GTW – Up to 14,000 lbs. * Even Full Size Trucks & SUVs have weight limits. Make sure your tow vehicle rating matches your travel trailer.